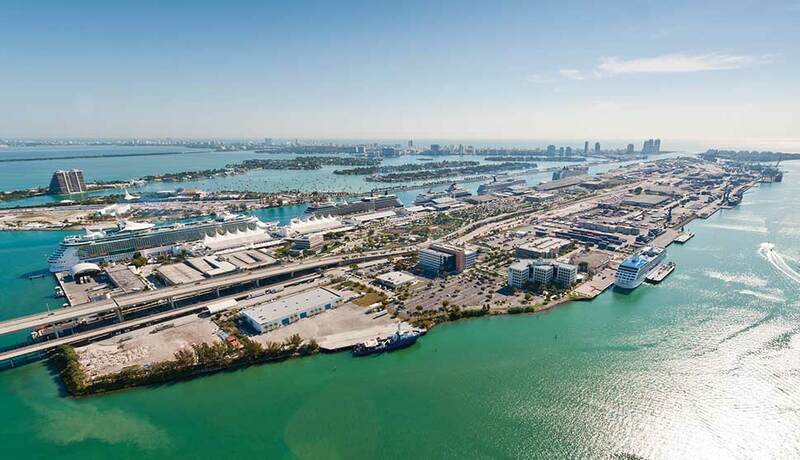 A proposal to put a $240 million maritime center – which would include convention space, a hotel, a yacht marina and related facilities – in the southwest corner of PortMiami could pump $76 million into county coffers in lease payments and taxes over 10 years. Miami-Dade’s Trade and Tourism Committee is to take up the proposal of Miami Yacht Harbor today (8/27). If the committee agrees, the county commission must rule. The three-phase complex would cater to the maritime industry, said Opal Jones, an equity partner in the project, which is being steered by MITC-2015, a Florida corporation that has Rene Lacomb of West Palm Beach and Jean Claude Verite of Miami as principals. The hotel would serve cruise and mega-yacht crews and tempt passengers to stay in Miami longer, while the convention center would become the premier showcase for new maritime concepts, Ms. Jones said. Repair and refueling stations, duty-free shops, restaurants and other uses would serve the marine industry, she added. The deal is complicated, and would require MITC-2015 to move the site’s current leaseholder, the non-profit Marine Spill Response Corp. (MSRC), to another part of the port. City of Miami officials would have to approve because of provisions under which the city gave the port to the county in 1960. MITC-2015 would sign a 45-year lease with the option to renew for another 45. It might obtain more land: MSRC had originally leased 8.69 acres in 1991, but in 2007 gave back 2.35 acres to the county. In the new deal, MITC-2105 might be allowed to lease and develop both MSRC’s current land and the returned parcel. “We would love to have the entire piece,” Ms. Jones said. The first phase could open 18 months after permitting, she added. Broward-based Tutor Perini would be the construction company. Miami-Dade would pay no expenses connected with the deal and the rent MITC-2015 offers is $400,000 more than what MSRC is paying, she said. The southwest parcel is sought-after. A 2011 port master plan said commercial uses could be allowed, giving rise to rumors that the county wanted to put office buildings or other uses there. In early 2014, then-PortMiami Director Bill Johnson and Charlotte Gallogly, president of World Trade Center Miami, met with officials at AmCham Shanghai to present a timeline for developing 48 acres in six phases. If it had gone forward, the plan would have added 300,000 square feet of retail, 4.6 million of office space, 1.2 million of hotel space, and nearly 1 million of residential. Later that year, a group of investors led by soccer legend David Beckham proposed a stadium for the site, which Miami’s Downtown Development Authority endorsed, saying office buildings there would unfairly compete with property owners downtown.